Several cities, including the city of San Diego, are trying to get rid of gas power, because burning gas contributes to climate change. That makes it all the odder that SDG&E might buy the Otay Mesa Energy Center, a gas plant outside of Chula Vista. 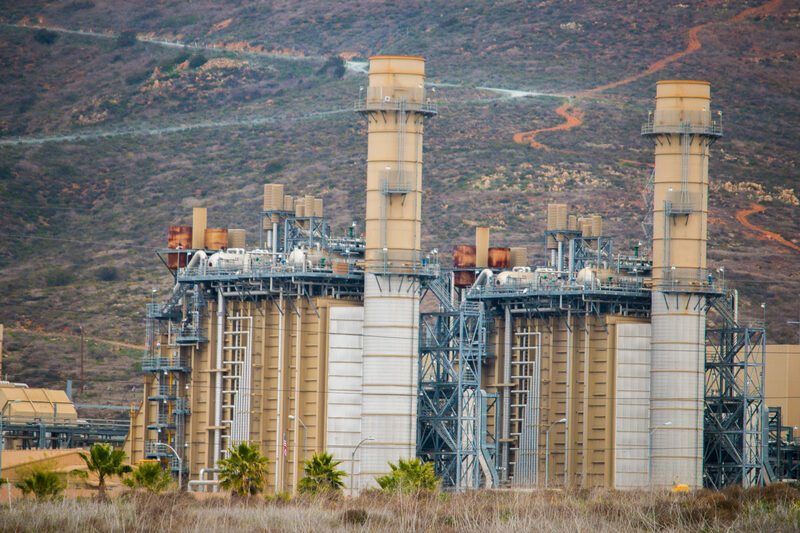 Even under pressure to burn less natural gas, San Diego Gas & Electric is preparing to spend more than a quarter billion dollars to buy another gas-fired power plant. Once it does, a third or more of the company’s electricity will come from company-owned natural gas plants. The deal, though, is not up to SDG&E. Several cities, including the city of San Diego, are trying to get rid of gas power, because burning gas contributes to climate change. SDG&E seems unwilling or unable to do that, in part because the region relies heavily on gas to provide reliable power. But several cities are bullish on green energy and are planning to create their own agencies to buy and sell clean power. If that happens, about half of the company’s customers may leave within the next few years for these government-run agencies, known as community choice aggregators, or CCAs. That makes all the odder that the company is likely about to buy the Otay Mesa Energy Center, a 9-year-old gas plant outside of Chula Vista. It would be the largest power plant owned by SDG&E. The company already owns four gas-fired plants – three in San Diego County, and one in Boulder City, Nev. If the company abandoned natural gas or lost most of its customers, the plants, including Otay, could suddenly become white elephants. That may explain why SDG&E seems reluctant to plan for a life without gas and why its parent company, Sempra Energy, is funding opposition to governments that want to enter the green energy market. The Otay deal is not entirely SDG&E’s fault. Indeed, the Otay deal is another strange and expensive legacy of Michael Peevey, the disgraced former president of the California Public Utilities Commission. Back in 2003, SDG&E was trying to buy a separate gas plant – the Palomar Energy Center in Escondido – from another Sempra subsidiary. These sorts of affiliate transactions are supposed to come under heightened scrutiny from the CPUC because a company is essentially selling expensive projects to itself and expecting ratepayers to pick up the bill. According to testimony given to the state Senate years later by a Sempra attorney, Peevey said he would approve the deal, with one big string attached: SDG&E had to agree to also buy power from the Otay plant, which is owned by Texas-based energy company Calpine. So, SDG&E ended up with way more power than it had been looking for, though in the wake of the energy crisis, that may have seemed less absurd than it does now. More details of that ordeal were reported in 2016 by inewsource. But the Calpine deal had another ticking time bomb. Calpine can also force SDG&E to buy the Otay plant for $280 million, even if SDG&E doesn’t want it. Brett Kerr, a spokesman for Calpine, said the company has not decided yet if it will force SDG&E to buy the plant, a decision that needs to be made by April 1, 2019. In SDG&E’s most recent request for a rate increase from the CPUC, the company assumes the fix is in and is asking for authority to set aside the $280 million for the purchase. Kerr made the case that San Diego still needs the plant. If Calpine forces SDG&E to buy the plant, SDG&E will profit on the money it is made to pay. The company typically gets about an 8 percent rate of return, according to the CPUC. If the deal happens, SDG&E may also find itself moving in the opposition direction of California’s two other major power companies, Southern California Edison and Pacific Gas & Electric. Edison has told state regulators it’s uninterested in buying more power plants. Instead, it says it’s focused on upgrading its grid to accommodate a new era where power doesn’t come from big power plants but from smaller projects, some owned by communities instead of companies. PG&E, meanwhile, is planning to close the largest power plant it owns, the Diablo Canyon nuclear plant. Its plan is to replace all that electricity, about a quarter of its power, with green energy. Once it owns Otay, SDG&E may have even more reason to fight plans that would force it to abandon gas-fired power. That’s because the company will be caught with an expensive asset that is designed to run for years down the road. Most of SDG&E’s profits come from the sprawling energy transmission and distribution system it’s built. But SDG&E estimates that, after it acquires the Otay plant, about 17 percent of its electricity profits will come from the power plants it owns. The Otay plant, which opened in 2009, was built to generate power for 30 years or more. The plant that SDG&E bought from Sempra at the same time, the Palomar Energy Center, opened in 2006 and also has a 30-year service life. SDG&E rejects the notion that the gas power it buys, particularly the power it has gotten from deals with Sempra, clouds its thinking about a greener future. Right now, about 43 percent of SDG&E’s power comes from renewable resources, according to state regulatory filings – the most of any of the state’s three major power companies. Another 42 percent comes from gas. Now, about half of SDG&E’s gas power comes from SDG&E-owned plants. If the Otay deal goes through, nearly 90 percent of SDG&E’s gas power could come from company-owned plants, based on 2016 figures.